Mother of three Lil Bremermann-Richard has an incredible and inspirational story, read on to learn how she became Group CEO of Oxford International Education Group whilst on maternity leave. 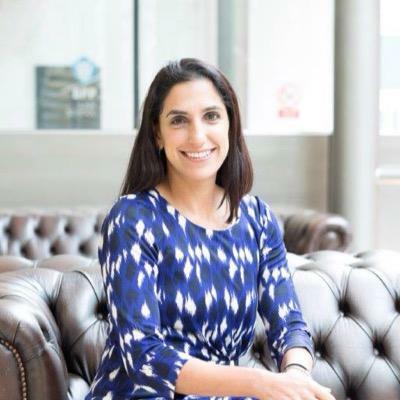 With over 15 years senior management and leadership experience in education, Lil’s previous roles include Director of International Recruitment for Cavendish College, Head of International Operations for South Thames College, and International Director at BPP University. In addition to her current position as Group CEO at Oxford International, Lil also serves as an Advisory Board Member for IDP Connect. Lil is originally from Uruguay but left in her early years as a teenager to come to the UK with her Parents. Her Dad at the time was a Diplomat but both of her parents worked with three children. In Latin America, maternity leave was 3 months and so most women went back to work and made provisions for childcare, which is more affordable than in Europe. Lil was raised to be incredibly independent she says that by the age of five she was getting herself dressed for school. Lil continued her education and began her career in the UK as her parents continued to work internationally. During her dissertation, she worked on a project based on a company that was so good that the company applied for her work permit and you can say that was only a glimpse into Lil’s outstanding achievements to come. Lil soon met her husband a Mauritian born, based in the UK also from a working family of three children. At the age of 28 Lil and her husband found out they were expecting their first child. With no family support close by, the ever so ambitious Lil and her incredibly supportive husband made the decision to do what they knew best and that was to continue to pursue their career goals and raise a family. It was clear to Lil that she would take three months of maternity leave. When it was time to return to work, the guilt induced from social peer pressure began to set in, as most Mums from her NCT group were taking a much longer leave of around a year. This made the experience of going back to work that much harder for Lil. However, her employers wanted her back because she was such a great asset to her organisation at the time. Eventually, Lil grew in the confidence that she had made the right decision. When it was time to work she gave everything to work and when it was time to be with the family she gave her all to her husband and child. She could truly say she was happy. A few years after Lil thought might need to take a different direction in her career, to allow her to think about growing her family. So, she opted to take a job in the public sector. Soon after, Lil learned that she got bored quite quickly and needed something with more pace and so moved back to the private sector. Now with two children, Lil continued to excel, holding senior Director roles within the sphere of international higher education programmes. Lil had made the decision that all her children would be breastfed throughout the first year irrespective of being back at work. With that commitment, she made sure that she had two, twenty-minute slots every day to express. She never allowed herself to be embarrassed by it and therefore it was never an issue for anyone else in the workplace. As someone with extensive management experience, Lil has always put an emphasis on managing via outputs and not inputs. She has always done what has been required of her and more, that often means working her office hours and then working from home in the mornings and or evenings. Her impressive achievements speak for themselves. During her time at BPP Lil set up overseas delivery centres in 6 countries, including Hong Kong, China, Pakistan, Bangladesh, Trinidad and Tobago and Mauritius. By the end of her time at BPP, the University was recruiting over 6,000 international students a year and had grown their annual revenue from £2m to £37m. Lil has proved her whole career that she can deliver and it’s the outputs and results of her work that speak volumes not how she delivers. Lil Joined Oxford International Education Group as Group Commercial director in October 2017. At the time Lil was set on her family of 2 children and took on the wonderful opportunity to lead commercial initiatives within the private equity backed group. Lil knew that she had an incredible opportunity to add significant value to a growth-focused organisation. In January 2018 Lil and her husband were very surprised with the news that they were 3 months pregnant. As the news settled Lil informed the Chairman of the business of her news, he congratulated her and expressed his support on her journey. Lil’s purpose and ambitions at this time were clearer than ever, she has always wanted to be CEO of a business and knew that she had the skill, opportunity and the talent to achieve this and excel in such a role. Therefore, it was clear that Lil was going to continue with her task of achieving impactful revenue growth for the company with a baby on way. Lil knew that she was capable of delivering results and that she will be able to deliver those results by the time she gave birth and continue doing so after giving birth. She did just that with the support of her team, everyone pulled together with such energy and drive and made it happen. From her years of experience, it was clear to Lil that the structure of the business needed to change and knew that by leading this change she could deliver meaningful results. Her husband fully believed in her and they were both committed to equal roles as parents and supporting each other to make their careers work. Whilst on maternity leave, the opportunity to become Group CEO became available and for Lil, it was clear that for her to be a good parent she needed to be happy and that meant pursuing her dreams. Full of confidence that she could drive the business forward, there was no doubt in her mind that she could do a good job and that a third child would not be an obstacle. She created the opportunity and the opportunity materialised. As a result, after 4 months of maternity leave, Lil returned to Oxford International Group in the role of CEO. During her tenure at Oxford International, Lil has been successful in driving huge growth across the Academic Division. Under her leadership, Oxford International University Pathways recruitment has seen a 70% increase on previous years. Lil and her husband do all that they can to make it work, with Lil mostly doing the drop off in the mornings and her husband doing late afternoon pickups. Sometimes they switch or cover for each other depending on their travel schedules. They have an au pair who helps with the youngest whilst the older two are at school. Lil is still expressing twice a day and relies on her wonderful husband to support her on her career journey. Lil is passionate about gender equality in the workplace, and actively mentors women in their leadership journey, as well as their return to work post maternity leave. I am incredibly grateful to Lil for sharing her story and to Vanessa Ampah for introducing me to the phenomenal Lil.